The two most powerful predictors of reading success are phonological awareness and letter-name knowledge (recognizing and naming the letters of the alphabet), according to the Center for the Improvement of Early Reading Achievement at the University of Michigan. Studies by Bryant, Bradley, McLean and Crossland show a strong relationship between rhyming ability at ages three and four and performance in reading and spelling at ages six and seven. "Once children become adept at noticing the ends of words (called rimes which is easy to remember because that is the part that rhymes), they begin to get the idea that the beginnings of words (called onsets) can sound alike as well," say Linda Rath and Louise Kennedy authors of The Between the Lions Book for Parents: Everything You Need to Know to Help Your Child Learn to Read. "Rhymes and alliteration make a listener aware of the individual sounds of language in ways that ordinary conversation cannot. The tongue twister quality of the text causes the reader to slow down in order to enunciate clearly the words," says Judith Schickendanz, author of Much More Than the ABCs: The Early Stages of Reading and Writing. Good readers can identify words that have the same first sounds (peas, potatoes, pasta), can create their own fun tongue twisters and enjoy books that feature rhymes and alliteration. Talk about odd and even numbers. Mark all the odd numbers on January's calendar with an "O" and mark all the even numbers with an "E."
Go to the Main Library and try the writing activities in the Youth Services portal entrance. Be sure to pick up a copy of the winter youth program brochure. Read five books from the "Writing" booklist. Write a thank you note together. Help your child write words, draw pictures and sign the note. 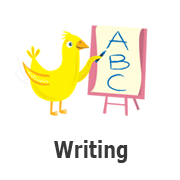 Provide your child many opportunities to write especially during playtime. Play activities often include writing such as receipts at the grocery store, grocery lists, tickets for police officers, or a sign in at doctor's office. Provide your child with paper, pencils or crayons so they can write when the play activity arises. Make a list of all your errands and have your child write or draw to help you out. Write a list for the grocery store and have him/her write three items they would like to buy while they are shopping. Use a map to explore with your child. Talk about the map; street names, trees, forests, names of cities etc. Have your child draw his/her own map or town.